Shopping for a Fortnite fan or do you love to play Battle Royale? 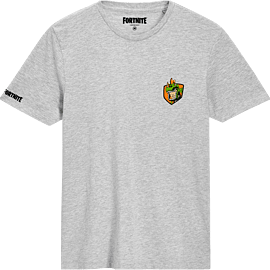 The Fortnite Rex Grey T-Shirt is a stylish option for any Fortnite players. The fan-favourite 'Rex' skin is printed on the chest and has ""Fortnite"" designed on the sleeve. You don't need V-Bucks to buy this t-shirt. Shop the Fortnite Rex Grey T-Shirt in kids size Small. Fortnite fans you don't want to miss out on this t-shirt! Introduced in the legendary Battle Royale game is Rex. The green dinosaur outfit quickly became a favourite amongst many players. The skin is available on the cash shop, but you won't need any V-Bucks for this stylish shirt. The Fortnite Rex Black T-Shirt has the loveable skin designed on the chest and the Fortnite logo on the sleeve. Wear your favourite skin with this simple but stylish design. Shop the Fortnite Rex T-Shirt in Grey today. This shirt is only available at GAME stores or at www.game.co.uk in the UK.